You can see a crystal dangling on the kneck of Luke Skywalker. It appears to be a Red Kyber crystal. Kyber crstyals are an important component of a Light Saber that give the weapon is strength, its connection to the Force and also its color. Generally Red crystals are the sabers of Dark Side while the other colors each reflect a certain mentality in battle, or philosophy. Early speculation is that this red crystal is his father's Light Saber's red crystal. Interesting enough the current run on Darth Vader comics is about how Vader came into possession and created that specific kyber crystal. The story of how it came to be is pretty amazing. There is a growing theory from Star Wars: Force Awakens called the Light Saber Theory where it is speculated that the images scene by Rey in the Force Awakens when she touches Anakin's Lightsaber are actually the memories of the Lightsaber itself. Something similar happens to Darth Vader in Darth Vader #5 where he begins to breakdown his Kyber crystal and make it into a red one. What this means is that the there are two important Kyber crystals each with their own memories. There are parts of this theory that are right. However, its leap is assuming whom's Rey's parents are. Especially since the person saved by Kylo in the vision occured far after she was dropped off on the planet of Jakku. However, the idea that Rey's vision is actually the memories of the Saber itself seem very likely. Especially after what is depicted in Darth Vader #5. It seems likely that visions seen by Rey which she hold's Anakin Skywalkers Lightsaber are its own memories. It may literally being telling Rey hey this is who I am, I know you. In the Last Jedi there are so far two important Kyber crystals with memories of the past. Anakins Skywalker's crystal has its own memories going back through the Clone Wars, to being held by Obi Wan, to being used by Luke against Darth Vader in Empire Strikes Back, to then being present when the Knights of Ren slaughter the new Jedi, to then being there when Rey is dropped off at Jakku (All shown in Rey's Force Vision from the saber). It seems that the person that had Anakin's lightsaber was saved by Kylo during the battle with the Knights of Ren, this may also be the person that takes Rey to Jakku. Curiousily, the Knights of Ren vision and Rey being dropped off seem out of order. It seems likely Rey as young as she was in the vision was dropped off prior to the massacre done by the Knights of Ren. I think this means that Rey was a known force user who was feared by Luke either she was related to someone bad like Palpatine, or was a Force Wound like the Jedi Exile Meetra Surik in Knights of the Old Republic 2. With Rey's seeming ability to learn the Force faster than Anakin, Luke, and Kylo it is possible that she is a Force Wound like Meetra Surik. At any rate she was likely a potential force user that was hidden, and denied training by Luke. Then someone, likely the person saved Kylo, the person that also likely dropped Rey gave the lightsaber to Maz Kanata. This person could be her parent, but also might be someone else. Darth Vader/Kirak Infil'a's Red crystal that Luke has in his possession would also have memories. It would have memories that would potentially span into ancient times as it had been used by the ancient Jedi Kirak Infil'a. He would also have memories of his father battling, and killing Kirak. He would then have the memories of the events of Darth Vader from the view point of the Light Saber crystal itself. Why would he hold on to this Kyrber crystal. Is the crystal actually luring him to the darkside? 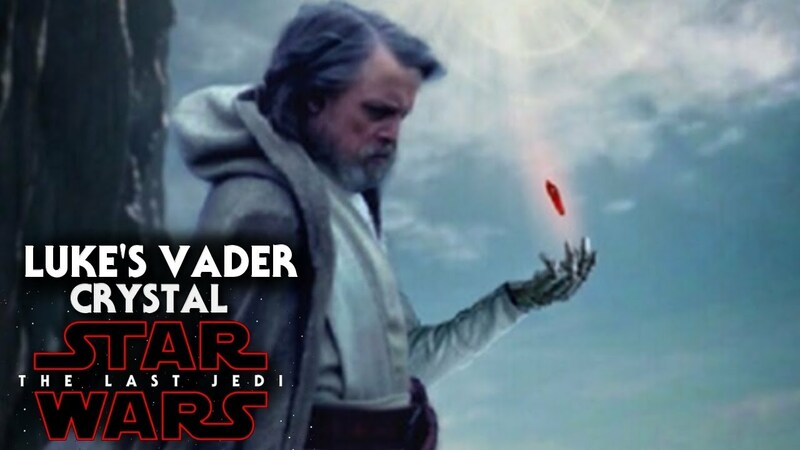 Is Luke using the crystal to search for answers about Snoke? Luke crystal has been shown in toys. You can see it on the Funko below. One interesting rumor topic thread is the red crystal dangling from Luke's neck. Many people assume that the crystal is a red Kyber crystal. The Kyber crystals are important components in a lightsaber blade and determine the blades color. The Red Blades and Red Crystals are associated with the Sith or broader the dark force users. Some have taken this as a sign that Luke is either now a dark force user or something inbetween. One other thing to note about the crystal is that Darth Vader's red kyber crystal is the focus of the current run of Darth Vader comics. Vader is tasked in that series to complete his training as a Sith by seeking out and killing a worthy Jedi and taking their crystal. Vader then enters into battle with a highly formidable jedi called Kirak Infil'a who nearly kills Vader in their first encounter. It is possible the crystal that Luke holds is this same same crystal and a spirtiaul memento of his Father. What does Darth Vader run tell us about this Kyber Crystal. The very existence of Red Kyber gem is a perversion and an affront to the Jedi and in effect the ultimate symbol of Sith. This is explained in detail in the Darth Vader comic series. According to the Emperor all Red Sith Sabers came from Jedi originally. Each would be Sith must hunt down and kill a Jedi and take their lightsaber's kyber crystal. These living crystals are then bombarded by pain until the crystal breaks or gives into the dark side. Effectively the crystal is tortured by the would be Sith until it can't take it anymore and becomes evil. It takes an extreme amount of Dark Side energy to break the crystal which is why a special place in Mustafar is used. This is a specific place highly attuned to the Dark Side. In this way the red kyber crystals are a reflection of the Sith themselves. Just as the Sith is a good person perverted by the Dark Side, so to are their weapons the Red Lightsabers. Darth Vader lightsaber kyber crystal is not an ordinary one. It is ancient and had previousily belonged to a highly powerful and ancient Jedi named Kirak Infil'a. One of Darth Vader's tasks to take up the ranks of a Sith Lord is to seek out and kill a Jedi and take that Jedi's Lightsaber crystal. Darth Vader wants to find the most worthy opponent he can but most of the Jedi have been killed at that time due to Order 66. Vader begins to look up at the Jedi Temple records for powerful force users who have taken the Barash Vows. The Barash Vow is a vow where a Jedi removes himself from the physical world and focuses entirely on meditating on the Force. Some speculate that Luke Skywalker has taken the Barash Vows in Force Awakens which is why he does not respond when his friends need help. In the Jedi Temple records Vader learns of the existence of an ancient highly powerful enforcer named Kirak Infil'a. Infil'a is said to be one of the greatest fighters of the Jedi ever. He was a Jedi who hung on the edge of the darkside and was used primarily in warfare. Vader confronts Kirak Infil'a and Infil'a almost immediatly knows what Vader is. He shruggs off Vader's force choke and lazily tosses Vader off a cliff where he is all but destroyed. Vader though is harder to kill then even Infil'a thinks. Vader maanges to tear apart a droid and reconstruct his cyborgnetic body. He then tracks down Infil'a again and after a long battle manages to kill him. Little does Vader know that another battle looms. Vader must now take on the crystal itself. This battle is nearly as hard as the physical battle that Kirak put him though. In Darth Vader #5 Vader has managed to defeat Kirak Infil'a and has taken his kyber crytal. He then begins to bleed out the crystal to pervert into a red crystal. The crystal mentally fights back and shows Vader a new path. It shows him wielding a green lightsaber and defeating the Emperor. Darth Vader seems moved by what the crystal shows up but in the end decides he must go forward that he has already come too far. Effectively, in order to make a red lightsaber the crystal must be filled with so much pain and rage that it is effectively tortured into changing colors. Despite the crystals's defense of itself by showing Vader a new path in the end he succumbs to the Emperors wishes. He says to the crystal, " No, I refuse. This is all there is." Luke's holding the crystal is interesting. Does the full history of the crystal come out? Can Luke sense its history all the way back to Kirak Infil'a? Is the crystal trying to work on him and pervert him to the darkside?